Save 40% when you buy workbooks by the case! 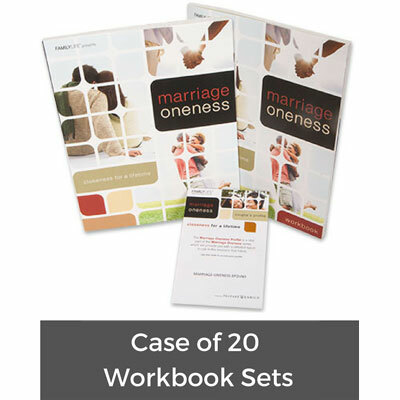 The Marriage Oneness Couple's Set includes two copies of the participant workbook and a Marriage Oneness Profile. Designed in magazine format as a listening guide for couples, the Marriage Oneness Workbook, when used with the eight video-based sessions, equips couples to grow in true intimacy, connection, and purpose. The workbook is filled with invaluable information, vignettes, real-life success stories, inspirational quotes, helpful resource information, and more. The confidential Marriage Oneness Profile (a $20.00 value) will lead couples to assess their closeness in the seven key areas that are covered in the study. This case includes 20 sets so you can equip your entire group! Tim and Lea Lundy have been married since 1990. They both grew up in Memphis, Tennessee, and attended the same high school and even the same church. They started dating in college, after which they married and began a life of ministry together. They served in churches in the Memphis area before serving two years in Bangkok, Thailand. After coming back to the States, they moved to Little Rock, Arkansas, where Tim--a graduate of Crichton College in Memphis and Dallas Theological Seminary--serves as a teaching pastor and directional leader at Fellowship Bible Church. He also serves on the Board of Directors for Leadership Network, and is on the Board of Fellowship Associates, a church consulting and leadership training organization. Robert Lewis was a Teaching Pastor and Directional Leader for Fellowship Bible Church in Little Rock, Arkansas, for over 20 years. He also serves on the Board of Directors for Leadership Network, and is on the Board of Fellowship Associates, a church consulting and leadership training organization.